Light, color and contrast are all key components of how a camera is able to focus on a subject. Unfortunately underwater we quckly lose all three making it challenging for cameras to focus quickly and accurately without assistance. 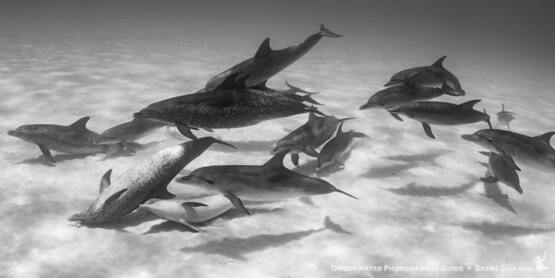 This is why a quality focus light is always recommended with your underwater photography kit. Look for a light that is small, easy to attach to your camera system, includes both a white and red mode. 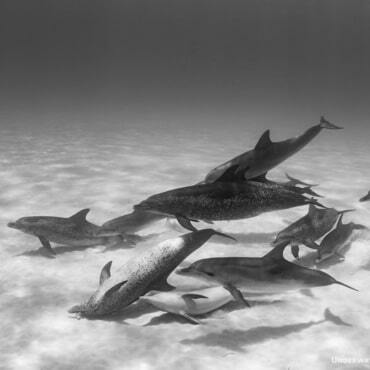 Many fish and marine creatures do not see the red spectrum since it disappears underwater, so a red light can be used to focus without scaring shy critters since they don't see the light. 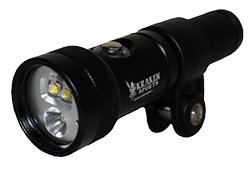 Some lights will offer advanced features such as auto shut off, or have a higher lumen rating allowing you to use them as a back up video or dive light. Choose the best light to fit your shooting needs and budget. The Bluewater Photo 1000 Lumen Focus Light is an exclusive focus light from BWP. It features a bright and wide white light in a compact body. 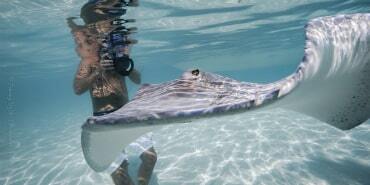 In addition, it also has a red light which is great for skittish creatures. In addition, it comes with a snoot which is great for producing creative macro photos. 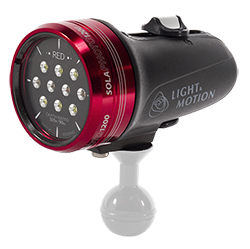 The Light & Motion Sola 1200 Photo Light has been a long time popular standard for high end focus lights. It features quality LED's with a wide white beam and red focus beam. Fully sealed to prevent flooding with an easy to use magnetic slider switch the light is also extremely light and compact. 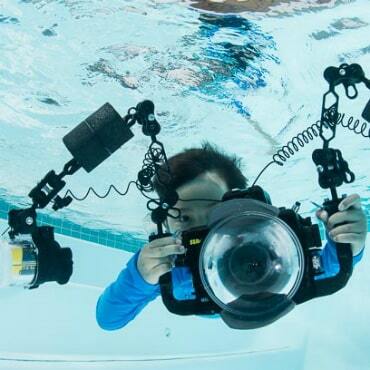 It's a perfect companion to any underwater photo rig. Fully sealed - no o-rings to grease! 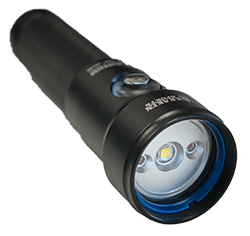 The Big Blue AL1200WXP Focus Light is a tiny, easy to use single beam, 1,200 lumen focus light. This light features a wide white beam with multiple power levels. The single push buton control is very simple to operate. The best part about this light is it's long battery life, 2 hours on full power and up to 20 hours on low. 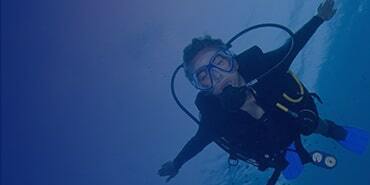 This is great if you dive often in places where you cannot recharge or swap batteries safely between dives. 2 hour battery life on full power, up to 20 hours on low! 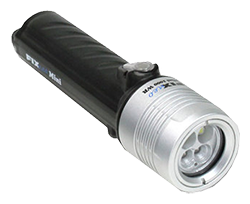 The FIX Neo Mini 1000 WR is a 1,000 lumen focus light with a clean wide white beam and a red focus mode. The light includes an auto shut off mode which turns off the light in tandem with your strobes firing to prevent any backscatter or lighting issues in your photo. 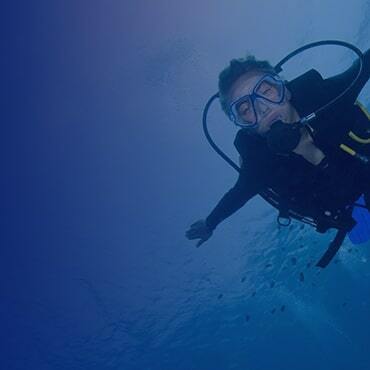 Easy to use with a single push button and easy to charge / replace the battery along with it's small size make it a perfect companion for the underwater photographer. The Kraken Sports Hydra 1000+ WSR is the most universal of the focus lights available. This light features a wide beam, spot beam and red focus beam. In addition it has an auto off feature which shuts the light off for 1 second when a strobe fires. WIth 1,000 lumens and a wide 100° beam angle all in a compact body it's a great choice for all levels of photographer.